Erway's Christmas Tree Adventure began in 1985 and has grown with each passing year. We are a family operated tree business with retail and wholesale sales that aim to provide the best quality trees at fair and competitive pricing. 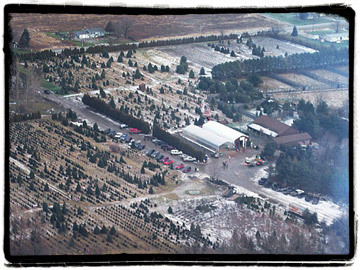 Our farm, with a combined total of 500 acres, is located in fertile Wilson, New York. Wilson has some of the best soil conditions and finest growing conditions in the area. Trees are nurtured by experienced farm hands to the peak of perfection in late fall. Although tree growing is labor intensive and takes many years of hard work, technology has afforded us with the ability to service the large fields efficiently. Years of experience has allowed us to meet the needs of large and small customers alike.